Oliver gives Team Arrow instructions while on a mission, but WildDog did his thing and did anything but follow orders. Oliver made it clear he was not impressed and told the Team he was taking a few days off. When Oliver returned home, Rory was waiting and revealed he was out of the team because every time he looks at Felicity, he sees the people that died. Oliver confronts Felicity who says she had to tell him the truth. Lyla interrupts them with a plan, but Felicity decides to sit it out. Oliver breaks into Palmer tech and tells Felicity he will check it out, but Felcity shows up and lets him know that she knows he lied and scolds him for his plan. The team tried to talk Oliver down from his plan, but Oliver managed to evade them. Tobias broke into the place Lance put the device. Felicity visited Rory to try get him back on the team, but he was clear that he didn't want to go back. 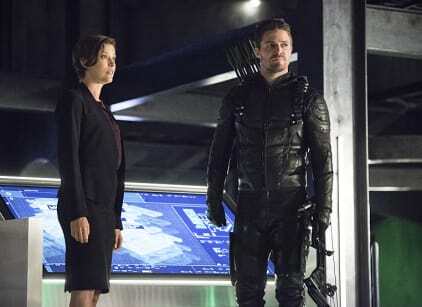 Lyla and Oliver infiltrated the prison to save Diggle, but he had been moved, forcing Oliver to go to another part of the prison. Rory returned to help the team when Tobias stepped up his reign of terror on the city. Oliver found Diggle and the two of them escaped through the floor. When they got outside, they were caught. Team Arrow were caught up in a fight with Church, but Curtis was hurt and WildDog was left behind to fight him. He was knocked out instantly and Church said he may still have use for him. Lance picked up the recruits, but they couldn't get WildDog. Later, when Diggle is home, Oliver returns to the team and informs them they are going to find Wild Dog. Rory: Do I even want to ask how you found me? Felicity: Is that a trick question? Permalink: Is that a trick question? How are we supposed to get to the SCPD, call an Uber or something? Permalink: How are we supposed to get to the SCPD, call an Uber or something?